Consequently, Keno is a game of pure chance! 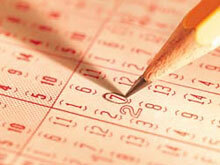 There is little Keno strategy which can be employed to help increase your chances of winning. Numbers are chosen randomly, therefore, no numbers that are drawn have any relation to those drawn previously. Although it sounds strange, if you choose five numbers on a ticket, there is no greater chance of seeing 9, 21, 35, 38, and 57 come up, than seeing 1, 2, 3, 4, and 5. Conclusion: Any number has the same chance of being drawn as the next. If you would like to see how the odds shape up in Keno, have a look at our Keno Probabilities page. Play the numbers that you haven't seen come up in recent games. The theory is that they will start coming up in order to make the long-term results for each number even out. The "random" nature of the game prevents this from being a certainty - and only assure us of the fact that this is purely a game based on luck. Instead of betting on the numbers that haven't come up the most often, a lot of keno players will bet on the numbers which have come up. As much as it goes against the laws or chance and probability, there are always interesting trends and patterns when dealing with randomly drawn numbers, and these streaks can be very profitable when capitalized upon. So, may the wheel of fortune turn your way. Pick successive numbers. Selecting pairs such as 12 and 13 or perhaps 43 and 44 would qualify as successive numbers. Although there is no proof this actually works over the long run it does seem like many of the numbers that come out are in consecutive pairs. This is a very popular belief among many Keno players. Use the same set of numbers consecutively. This strategy is very simple and the most common: play the same selection of numbers for a few rounds. Wether you play the same set of numbers or not - your chances for being a winner stays the same. Remember that there is nothing strategic' about these systems, but they definitely are a bit of fun and they certainly will not harm your chances of winning. It is always good to take a chance, especially when you know your chances of winning are less than zero. Good Luck!! Play the Game!